First, let us quickly review the switching AC/DC conversion. See the basic circuit shown on the right and the waveforms given below it. Here, based on the conditions prevailing in Japan, we assume the input voltage to be 100VAC. The 100VAC is first rectified in a diode bridge, resulting in full-wave rectification. The process of rectifying the 100VAC input as is requires the diode bridge capable of withstanding high voltages. A 100VAC input in terms of a peak value can attain voltage values as high as 140V. In the next step, we conduct smoothing using a capacitor. This process, too, requires the capacitor capable of withstanding high voltages. In principle, an AC/DC conversion is performed at this point. However, producing a DC voltage suitable for use in commonly available DC drive circuits requires several additional steps. The high-voltage DC output undergoing a conversion by the rectifier and capacitor is chopped by the on/off actions of the switching element and it is transferred as energy to the secondary side via a high-frequency transformer. The on/off frequency of the switching element, that is, the switching (chopping) frequency, represents a considerably high frequency, such as 50kHz, compared with the original 50/60Hz frequency. The chopped DC voltage takes the form of AC square waveforms, as illustrated in the figure. The high-frequency AC voltage is rectified by a secondary-side rectifying diode, smoothed in the capacitor, and if the DC output voltage is set to 12V, it is converted to 12VDC. Although omitted in the figure, the high-frequency AC rectified waveform becomes a half-wave rectified wave that results from a single diode. The AC-to-DC conversion process, in short, works as follows: On the primary side, the 100 VAC input is transformed to a high DC voltage by the direct rectifying and smoothing of the 100 VAC input. In the next step, the high DC voltage is converted to high-frequency square waves through the use of switching elements, and the results are transmitted to the secondary side via a transformer. On the secondary side, any high-frequency AC voltage that arises is subjected again to a rectifying – smoothing process to convert it to the target DC voltage. This method, in order to convert a 100 VAC to a desired DC voltage, requires the control of the on/off time for the switching element. For this purpose, control circuits (a control IC and a feedback circuit) are used. This results in the basic switching AC/DC conversion. 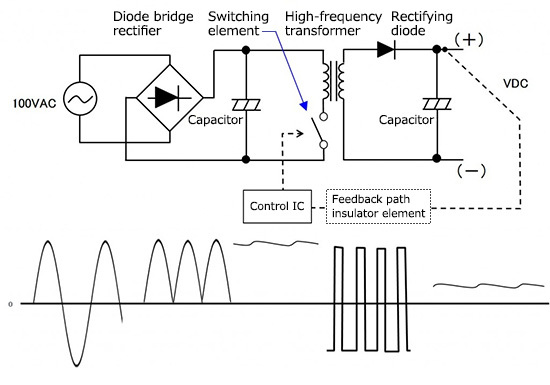 ・The switching AC/DC conversion involves the direct conversion of high-voltage AC to high-voltage DC, and a reconversion of the result to AC, thereby producing a low-voltage DC.